It can prove to be difficult to find Disney World accommodations for large families at an affordable price. So I was happy when Disney World Family Suites were added to Value Resorts. My family of 7 tried them both when my youngest was under 3. 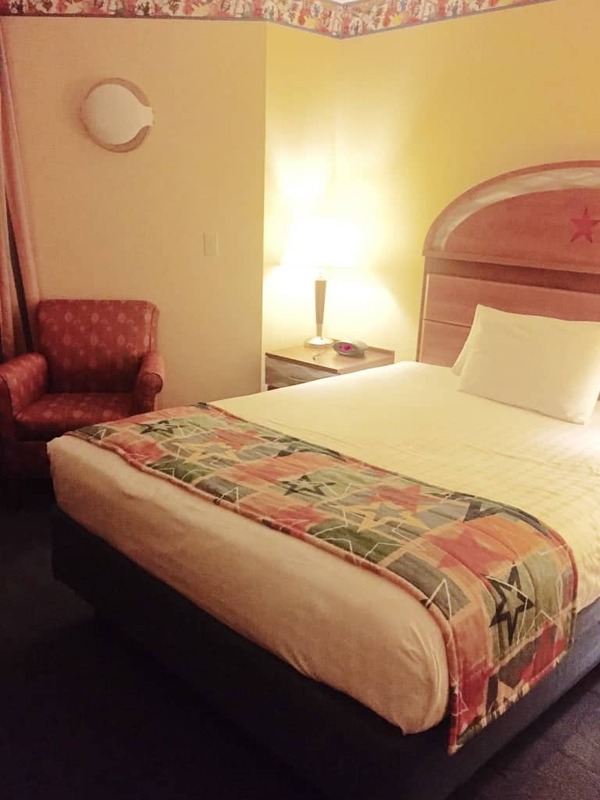 So which Disney World Family Suites are best? I’ll compare Disney’s Art of Animation Family Suites and Disney’s All-Star Music Family Suites, so you can decide which is better for your family’s next Walt Disney World vacation. Which Disney World Family Suites Are Best For Your Family? There are a lot of Disney World Resorts with suites. However, most of them are Deluxe Villas which can be very expensive. The Disney World Family Suites in the Value Resorts provide a more economical option for bigger families or families who just want some more space. My family and I have stayed in a plethora of Walt Disney World accommodations for large families. The list includes Value Resort Family Suites, 2 Value Resort hotel rooms, 2 Moderate Resort hotel rooms, 2-bedroom villas, and 2-bedroom suites. We have also tried both Value Resort Family Suite options at Disney’s Art of Animation Resort and Disney’s All-Star Music Resort. There are pros and cons to both. These are generally set up for parties of 6 or fewer, but we stayed here when my youngest was under 3 years old, so we were legal with all 7 of us. We loved the Disney World Family Suites. Biggest plus: 2 bathrooms! The things both Family Suites at Disney World have in common are two bathrooms with a separate bedroom and sitting room, and a kitchenette (which includes a microwave, coffee maker, and small refrigerator). The newer of the two, this hotel’s theming is incredible. Disney’s Art of Animation Resort is one of my favorite resorts! You can’t help but smile from ear-to-ear when you look around. Tons of bright colors, larger-than-life icons, and scenes from Disney•Pixar movies. There is a Art of Animation Cars Family Suite, a Finding Nemo themed Disney World Family Suite, and a Lion King section with themed rooms. There are some Little Mermaid rooms, but they are not family suites. The Art of Animation Finding Nemo family suites cost a little bit more for the location. They will be closest to the main building. These family suites at Disney World are approximately 565 square feet. The Big Blue Pool is the largest Walt Disney World Resort pool, and it is a zero-entry pool, which is a big bonus for my little Nemos who don’t have lucky fins and aren’t good swimmers. There are 2 other pools, too, at the resort. Landscape of Flavors is a favorite food court of mine. They have different quick-service options other than your typical pizza and hamburgers. With choices like a Surf and Surf Burger, make-your-own salad station, and a make-your-own pasta station, you are bound to please everyone. In my opinion, the transportation is better at Disney’s Art of Animation Resort. They have one dedicated resort bus stop, and it does not share with other resorts. Also, you have interior rooms inside a building compared to outside walkways at Disney’s All-Star Music Resort. Other pros include a kitchen table with chairs which is very helpful for breakfasts. 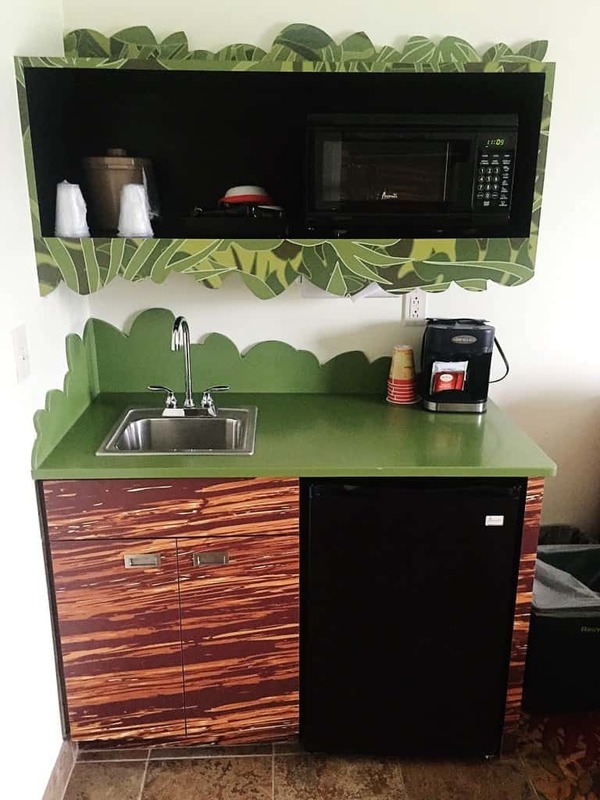 You have a kitchenette, so you might as well use it. We ate cereal, donuts, muffins, or something quick in the mornings, which saved us money at the parks. The cool thing, too, is you pull down on the green handles on the side, and voila, the table turns into a double-size convertible bed. It’s probably the most comfortable bed in the suite. I was pretty surprised. Warning: If you have multiple small children they will fight over this bed, which may cause some contention, which may lead to you saying you need a walk and head over to Landscape of Flavors for a snack. The biggest con to the Art of Animation Family Suites is that they are more expensive than Disney’s All-Star Music Resort. Depending on the season, there’s about a difference of $70-$80 a night. If you’re staying for a week, that’s a chunk of change. The other con, too, is the size of the kitchenette. It’s pretty small, and we didn’t have much room for groceries. A possible con is the layout of the Art of Animation Family Suite. If you have kids or grandma who doesn’t necessarily like sharing beds, the layout of Disney’s All-Star Music Resort has 2 twin pull-out beds rather than the 2 bigger beds meant for sharing. It just depends what your family prefers. Disney’s All-Star Music Resort is also a fun resort! They have large musical instrument icons like guitars, drums, saxophones, and maracas. The family suites are approximately 520 square feet. There are 2 pools at this resort and a water play area for smaller children. It is within walking distance to Disney’s All-Star Movies Resort and Disney’s All-Star Sports Resort, so we’ve gone exploring to other resorts, and the kids enjoyed it. I actually hold a soft spot for the Three Caballeros, so this pool makes me happy. These Disney World Family Suites include a bedroom with a queen-sized bed, a living area with a double-size sleeper sofa, a sleeper chair, and a sleeper ottoman. If you stay in a family suite, you automatically have a preferred location and are close to the main building with check-in and the food court. The kitchenette has more storage, is bigger, and is out of the way. The Intermission Food Court is kind of small and does not have the selection of flavors as Landscape of Flavors. But there are still plenty of options and my children probably enjoyed the food here better, because their palate is well, unsophisticated. Pizza and chicken nuggets are their go-to choices. Now, these Disney World Family Suites were added in 2006, and as far as I know, they haven’t received furniture updates or refurbishments aside from TVs. So you notice the wear on them. The furniture is looking worn, and there’s a tiny 2-person table that’s pretty standard in all the hotel rooms, so eating breakfast was tricky with a larger family. Disney bus transportation can be shared with the neighboring All-Star Movies Resort and All-Star Sports Resort. That’s usually during the middle of the day when the crowds aren’t as heavy. However, it can be annoying when your kids are tired and need a nap or you need a nap. Most of the time it’s fine though. All Disney buses are fickle. But if you have your own car, then it doesn’t really matter. The beds aren’t as comfortable as the beds in Art of Animation. It worked for my children, because they like their own beds, so the little ones were thrilled with an ottoman sleeper and the chair sleeper. Which Disney World Family Suites Should You Choose? The Disney World Family Suites are awesome! This is a good budget Disney World accommodation for larger families. I would even recommend them to smaller families where parents just want some privacy. 2 TVs, 2 bathrooms, a kitchenette, more square footage. You get all the amenities of staying on-property like Extra Magic Hours, Disney’s Magical Express, free transportation to and from the theme parks, and added activities like pool parties and movies by the pool. If the price were equal, I would choose Disney’s Art of Animation Resort Family Suites all day, every day. However, the price is not equal. So my budget and length of stay would determine which resort I chose. This may be backward, but if I was only staying a couple of nights, I would choose All-Star Music. The savings could buy my family a character dining experience meal like the Bon Voyage Character Breakfast with Rapunzel. However, if I’m staying longer, I want to be more comfortable and enjoy the resort amenities, perhaps skip a park day and relax at the hotel and visit Disney Springs. I just sent my parents and cousins to the family suites at Disney’s All-Star Music Resort, and they had no complaints. So which Disney World Family Suites would you choose? Check out these tips to avoid waiting hours in line at Pandora – The World of Avatar. And if you’d like to save even more money on souvenirs, here is the best Disney outlet closest to Walt Disney World. aw man, now I want to go to AoA. I forget how fun that themed pool area is! It really is great! You should take #OhLucy there! Hi Tania! We stay there one night two years ago for the first time, my kids love itI Saludos! Between the slightly larger size rooms, the excellent food court and the great pool, AofA is a great choice if the budget allows it. I agree! If they were priced the same, AOA all day, every day.